The World Health Organization (WHO) estimates that more than 65 million people need a wheelchair that meets their individual physical/postural requirements, as well as the environmental conditions in which they live. Research has determined that more than 80% of all wheelchairs manufactured worldwide are designed for the developed world and European standards, thus suiting the needs of only 20% of potential users. The requirements of people living with mobility disabilities in rural and under-developed regions have never been considered a viable market factor, which has resulted in a serious neglect of this sector. Additionally, 75% of all wheelchair users need personally adapted or modified equipment. Shona McDonald, an artist until the birth of her quadriplegic daughter, was inspired to seek a more effective solution for future mobility. She started two non-profit organizations and then created the Shonaquip after frustrating experiences trying to address the needs of the broader community. Shonaquip works to improve this imbalance. It not only offers devices that fit the unique needs of the individuals, but also provides support services and training for wheelchair users and their caregivers, family members and healthcare workers. Shonaquip also provides community-based clinical services and training workshops on proper wheelchair fitting and the importance of postural support. 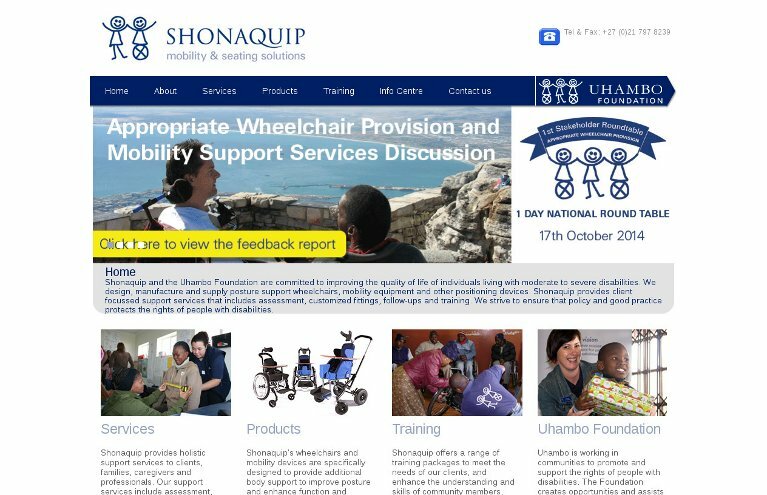 Through various partnerships, Shonaquip plays a leading role in improving the quality of life for people with mobility disabilities, particularly children, through enhanced services and the provision of customized equipment. One example, the Madiba Buggy was the first South African posture support wheelchair for children afflicted with cerebral palsy. It can be used on uneven terrain such as sand, rocks and hilly areas. They are redesigning it to be more cost effective and efficient. How do wheelchairs go down stairs?